Classically Liberal: Warming advocates feel the heat. The beware-of-warming crowd is starting to feel the heat. And it isn’t because of a warming planet either. It almost seems as if everything that could go wrong for them, is going wrong. Now, I would never be one to claim that weather anomaly is proof that anthropogenic warming is wrong. I know that particular weather disproves climate change. We all know that such things can only prove that warming exists. In the realm of warming activism weather is a one way street. So Katrina was proof of warming. That 1998 was a particularly warm year was proof of warming. That California experiences droughts is all part of warming. Ditto for droughts in the UK, or floods, either will do. But still those nasty cold winters that seem worse than usual are never proof of anything but they do cause the public to wonder. And this winter has been another very nasty one. Consider the poor people on Hiddensee, an island just off the German mainland. This resort island is completely ice bound. The German military has been flying in to rescue tourists on the island. Resident of the island rely on trade with the mainland for their food supplies and so shelves were getting bare. The military also flew in food. According to Spiegel the sea between Hiddensee and the island of Rügen “is now an ice sheet around 30 centimeters (12 inches) thick. An icebreaker failed to make it through to Hiddensee on Monday forcing the authorities to use helicopters to supply the island and pick up trapped vacationers.” Spiegel says that the ice “is not expected to melt until the end of February” which seems to imply that regular helicopter food deliveries will be required. 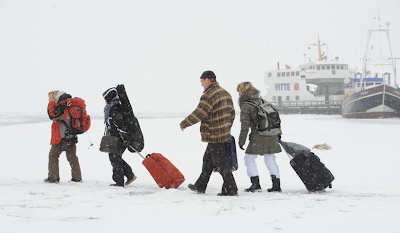 Some tourists, trapped on the island when ferry service as shut down due to the ice, didn't heed the advice of authorities and walked across the Baltic Sea in order to get home. Meanwhile the scientists who have led the campaign to convince the world of the dangers of warming are under scrutiny as never before. Major media sources, for the first time in memory, are starting to investigate the InterGOVERNMENTAL Panel on Climate Change and the tiny band of warming advocates who make up the elite in that field. The New Zealand Herald, the largest newspaper in the country, recently editorialized about the need for “facts, not anecdotes” from the IPCC. The IPCC's reputation is not helped now by the argument of authority its supporters have employed for so long. Criticism was dismissed as conceit in the face of a "scientific consensus" that by implication could not be wrong. Today the Guardian reveals how Jones withheld the information requested under freedom of information laws. Subsequently a senior colleague told him he feared that Jones's collaborator, Wei- Chyung Wang of the University at Albany, had "screwed up." The Guardian, of course, is not willing to question warming orthodoxy itself, but they do say their investigation does “call into question the probity of some climate change science.” To be precise it doesn’t call climate change science into question, but climate change theory. Already London’s Sunday Times and the Sunday Telegraph have been exposing IPCC errors and distortions fairly regularly. But it isn’t a small feat to have shaken the confidence the editors at the New Zealand Herald had previously shown for the IPCC. And it is a huge step when the very left Guardian starts exposing some of the antics of leading warming advocates. It’s bad enough that nature is not cooperating with warming theory. But, if more main steam media outlets starting turning a critical eye on the IPCC and its core group of scientist/activists, the whole political agenda at work here could unravel. Photo: Trapped tourists from Hiddensee ignore official warnings and walk across frozen sections of the Baltic Sea in order to get home. posted by blog owner at 2/04/2010 06:41:00 AM DiggIt! Reddit Del.icio.us Slashdot It!